The global coil coatings market is largely fragmented in nature, with globally prominent players holding small shares compared to the larger share collectively held by the regional players. In 2014, The Valspar Corporation, Akzo Nobel, N.V., Beckers Group, and PPG Industries, Inc., together took up about 56% of the market. According to a research report released by Transparency Market Research, a lot of the key players in the global coil coatings market hold prominent market positions in multiple regions. At the same time, companies such as Nippon Paints Co. Ltd. hold large production volumes but are concentrated to one region, while looking for expansion opportunities. The global coil coatings market is expected to expand at a CAGR of 4.6% within a forecast period from 2015 to 2023, with respect to its volume. The market’s production volume is expected to touch 1,384.4 kilo tons by the end of 2023. 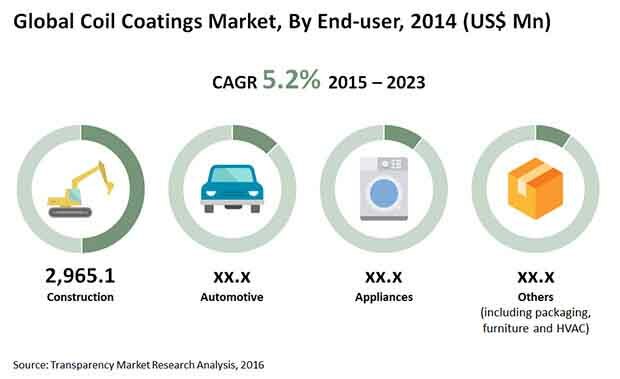 In terms of revenue, the global coil coatings market is expected to reach US$6.27 bn by the end of 2023. The demand for polyester in the global coil coatings market is expected to hit 888.2 kilo tons in 2023. Polyester is highly favored as a coil coating and will continue to lead the global coil coatings market over the coming years. It offers high level resistance to weather effects and corrosive exposure in a large number of scenarios, making it easier for both manufacturers and application industries to cover up for a diversified requirement using a singular product. Compared to polyester, other materials hold very minor shares in terms of demand as well as production volume. A lot of these products such as PVDF and silicone modified polyester serve specific purposes and mostly serve niche purposes. “The global coil coatings market is expected to witness a very positive impact on demand coming from the construction industry. This has a lot to do with the increased undertaking of non-residential construction projects across the world and especially in emerging economies,” states a TMR analyst. This case is visible in the U.S., Canada, Mexico, Brazil, Turkey, Australia, China, and India, where the spurred construction activities in the industrial and commercial sectors is pushing for a huge demand for coil coatings. The global coil coatings market does naturally find greater scope of application in non-residential buildings, such as factories, industrial project sites, and commercial buildings. Advanced coil coatings are excellent in protecting industrial coils from weathering and abrasion, while also providing a more positive aesthetic appeal to the metal. One of the key restraints acting on the global coil coatings market currently is the recent economic crisis in Europe. The region’s declining economy had put a massive choke on the demand for coil coatings across its industries. With construction, automotive, and appliances manufacturing rates slowing down, the global coil coatings market has felt the consequent brunt of the burden. This issue could resolve steadily over the coming years as the European economy rises up again. “Top players in the global coil coatings market are already looking for expansion opportunities in the MEA region. As far as growth rate is concerned, the massive upswing in demand for coil coatings in the Middle East and Africa is expected to surpass the growth rate shown by any other region. This applies especially to the region’s industries of appliances and construction, both of which are experiencing a highly favorable growth phase,” adds the analyst.